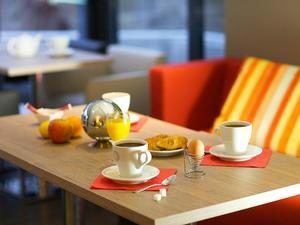 Hotel de France is an elegant, contemporary hotel based in the beautiful city of Valence in the heart of the Northern Rhône region. It is the perfect place to stay both to discover the city and of course, the famous wine region. The good quality facilities and the pleasant rooms will guarantee a comfortable stay. Ideally located in the heart of the old Valence, the hotel is only a few steps away from the picturesque Place des Clercs. You will have the opportunity to visit the Saint-Apollinaire Cathedral, the Maison des Tetes, the Pendentif of Valence, or the Draper’s House amongst other fascinating attractions. Valence is about an hour’s drive from Lyon and Avignon can be reached an hour and a quarter by car. The lounge bar is open all day every day, ensure guests a relaxing moment in a harmonious and comfortable setting. It is the perfect place to enjoy an afternoon tea, a coffee or an aperitif. 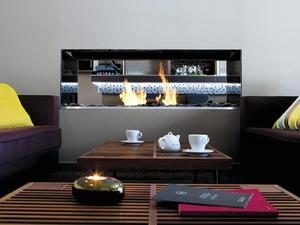 The cosy sofas and charming fireplace create a peaceful and convivial atmosphere. If the weather permits, a delightful terrace will be at your disposal for breakfasts and drinks throughout the day. A conference room is also available to combine business with pleasure. 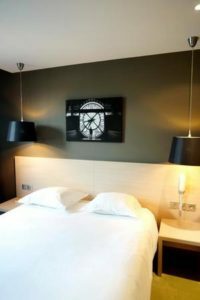 The charming rooms of the hotel have lovely views of the inside courtyard or of the city’s splendid Haussmann buildings. They are soundproofed and all have air-conditioning, Satellite TV and complimentary WIFI. Room grades include Standard, Superior, Junior Suites and Suites. Suites and Junior Suites also include mini-bars as well as a lounge or study areas.